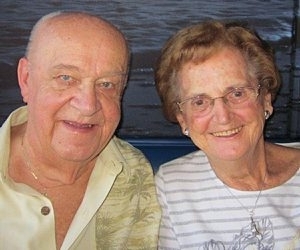 Mr. and Mrs. Frank Sewastynowicz of Deerfield Beach, Fla., formerly of Cheektowaga celebrated their 65th wedding anniversary with a Mass at St., Ambrose Catholic Church in Deerfield Beach, Fla., followed by a lunch on the ocean in Fort Lauderdale. The entire family celebrated together at Disney World, Orlando, Fla. Mr. Sewastynowicz and the former Alice Murszewski were married Feb. 12, 1949, in St. Stanislaus Catholic Church, Buffalo. He is a retired linotype operator for Artcraft Printing in Buffalo. She is a retired billing clerk for Niagara Hobby, Buffalo. They have three children and three granddaughters.